I recommend including a fresh salad with lunch and dinner every day. Fresh vegetables in the form of tasty salads are great for aiding digestion and an excellent way to get some of our daily required vitamins and minerals. 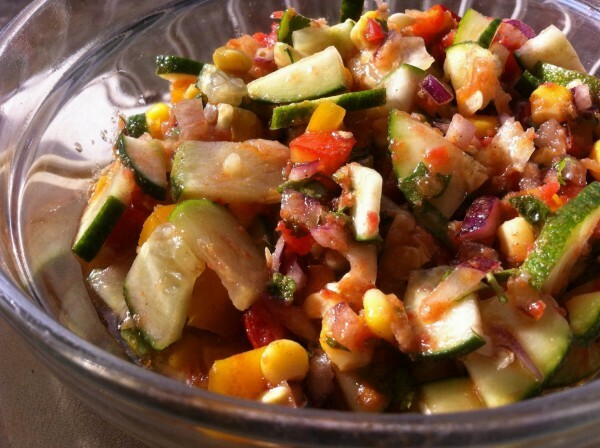 The vinaigrette/dressing recipe I have provided is a great way to bring more flavour and excitement to your salads. Many of the colon or digestive issues we have are as a result of the lack of digestive enzymes found in raw foods to go with our heavy cooked foods. Remember, food is also our medicine. My Summer Stew is a constant in my kitchen right now. It’s not only alive and raw; it’s hearty yet refreshing, and very nutritious yet tasty. Unlike traditional stews and soups, it is a great alternative to enjoy over the hot summer days. Can be had alone or part of lunch or dinner. Mix all ingredients in a large bowl. Let this chill or let stand at room temperature for 30 minutes before serving. Goes well with quinoa or cauliflower rice. Enjoy! Blend all ingredients together in a blender. Drizzle over salad. Store in a glass bottle or container in the fridge. Nakawuki, who is currently working on her recipe book, will be hosting a “Live Dinner & A Movie” event in Montego Bay tomorrow in honour of International Raw Food Day. She also hosts a bi-weekly Sunday Brunch & Open Mic Poetry at Adwa Vegetarian Restaurant in City Centre, Montego Bay. Next up is a 10 Day Kemetic Yoga Retreat in Negril later this month and a wellness live food brunch at Mynt Retreat in Montego Bay with an inspirational guest speaker who survived cancer five times (Pat Wright) on Sunday, July 26th. Like her Facebook page for all the details.